Posted on October 31, 2012 by Michele D.
As a few of you might know, I found out 2 weeks ago that my job was being eliminated. I’ve never actually been laid off before so it was a weird feeling to say the least, and I immediately kicked into savings mode. What can I cut-out that will allow us to stretch our money further? I’ve always said I was going to use the existing food I have in my tiny little pantry, refrigerator and freezer before buying anything new to add to our stock pile but have neer actually done it. This seemed like a great time to start this project. I know I’ll have to continue buying fruits, vegetables and dairy products but I probably have enough food to last us for a very long time. It was a bit cold in Dallas last night so I decided to make us a soup for dinner. I had on-hand: chicken soup stock, miso paste, Pareve Soy cheese (Follow your Heart Vegan Gourmet Mozzarella) that I’d recently used in my experiment with Kosher Chicken Cordon Bleu, soy sauce and a few green onions. 3 ounces firm tofu, cut into 1/2-inch dice (1/4 of a 14-ounce block) (I had about half of a block of the Follow your heart vegan gourment mozzarella from my Chicken Cordon Bleu so I used that. It is soy after all and it really doesn’t have much taste but it does have the same consistency as tofu). 4 medium shiitake mushroom caps, thinly sliced (I didn’t have any mushrooms so I left out this ingredient. My 6 year old won’t touch mushrooms anyway). Bring the water or chicken stock to a boil over medium heat. Lower the heat. Add the miso and stir to help it dissolve. Add the soy sauce and the tofu. Stir. Add the shiitake mushrooms and scallions and heat through. My husband was loving the soup until I told him the “tofu” was actually pareve soy cheese. Then he decided he liked the stock but not the “marshmellows” as my daughter calls tofu. But to me, the fake cheese cubes tasted very similar to tofu and were a nice substitute. Overall, it was not bad considering I had to make do with what I had. In the future, I’d like to make this recipe with the actual ingredients it calls for and include sushi with the meal. Yum. Have any of you made Miso Soup? Do you have any tips or tricks you want to share? On a happy note, about a 1 1/2 weeks after I was laid off, I received a job offer within the same company, so thankfully my unemployment did not last long. I’m thrilled to be back at work, but I’m not giving up on my “use what’s in my pantry” challenge. Anyone want to take it with me? Posted on October 28, 2012 by Michele D.
Many years ago, I went to work for a company that was in process of relocating from New York City to Dallas. They temporarily moved me and a coworker (who I didn’t meet until we were at the airport) to train in NY for several weeks. We had the opportunity to work in the city and explore like tourists after work. We had a blast. We lived in a great apartment at 53rd & 7th. There was a Ray’s Pizza on the 1st floor of our building that seemed to stay open all night – and we didn’t mind one bit. This was long before my Kosher-keeping days. One evening, a NY coworker offered to cook us dinner. He banged around in our kitchen for a while and finally came out with the most unbelievable food. It was my first experience with Chicken Cordon Bleu and I was in love. It was the most juicy, yummy chicken (and ham and cheese) I’d ever tasted. Said coworker later taught me how to make this amazing chicken and I prepared that dish several times later before starting to keep Kosher. Of all the foods I miss now, Chicken Cordon Bleu has to be at the top of my list. Preheat oven to 350 degrees. Coat a 9 x 11 baking dish with nonstick cooking spray. Fold parchment paper around chicken breasts and pound them to ¼ inch thickness. Be careful not to rip the flesh. Mix together the breading mix, spicing to your taste – white flour, breadcrumbs, Panko and spices such as salt, pepper, Italian seasonings. Sprinkle each chicken breast on both sides with salt and pepper. Place 1 slice “mock” cheese and 3 slices of deli meat (salami) on top of each breast. Roll up each breast, and secure with toothpicks. The Vegan Gourmet Mozzarella comes in a block so I sliced it into fairly thick slices about ¼” thick. 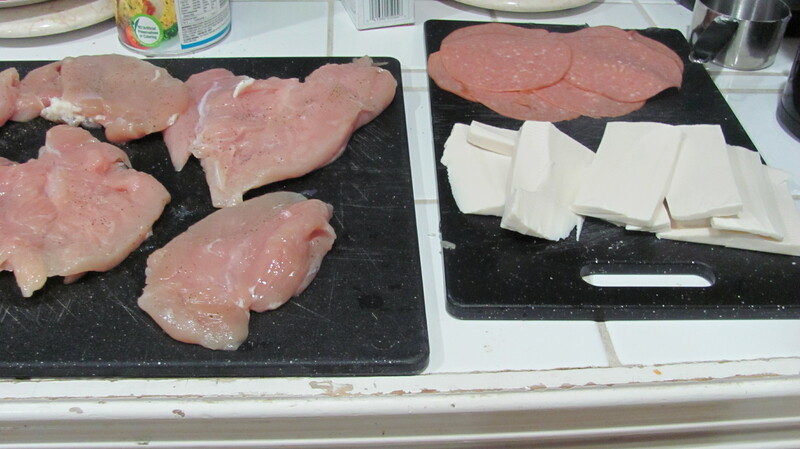 I wrapped 3 thin slices of the Salami around the slice of cheese and added to center of chicken breast. Gently dip each rolled chicken breast into the egg and then roll in the breading mix until completely covered and lay in your 9 x 11 baking dish. Lightly spray each breast with Pam or other cooking spray. Now here’s where I was a bit lazy. The Joy of Kosher recipe says to fry the Chicken Cordon Bleu and this is exactly how I was taught to make it back in NY but I wasn’t in the mood to deal with flying grease so I chose the baking method from the All Recipes directions. I think the chicken would have turned out better if I’d gone the frying route and I will definitely try this next time. Bake for 30 – 35 minutes or until chicken is no longer pink. Remove from oven and place ½ cheese slice on top of each breast. Return to oven for 3 to 5 minutes or until cheese has melted. I ended up having to broil the chicken on high for about 3 minutes to get the cheese to melt. That darn pareve cheese is stubborn. Overall, it was not a bad first attempt at making Kosher Chicken Cordon Bleu. The cheese inside the chicken breasts did not melt so that yummy, oozing cheese/salami mixture was definitely missing. And the breading was not as crispy as I remember from my Treif days. I’m wondering if frying would have taken care of both of those problems. I’m thinking for the next round, I might use the same cheese, which has a nice taste by the way, and also add the mayonnaise mixture that Ahuva Staum suggested. Also, the original Chicken Cordon Bleu recipe calls for Swiss cheese and I couldn’t find a mock Swiss cheese at Wholefoods but I love Mozzarella so went with that. 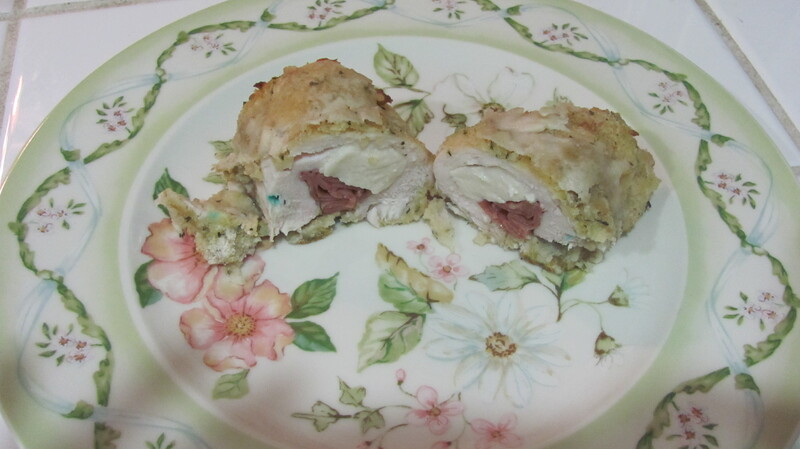 Have any of you attempted Kosher Chicken Cordon Bleu? If so, please share how you made it. Posted on October 23, 2012 by Michele D.
Optional: chopped up red bell pepper, baby spinach, carrots or any other vegetable that you like. The red and green from the pepper and spinach add great color to the dish. I haven’t tried it but I’ll bet peanuts would be a nice addition as well. In a small bowl, beat egg with water. 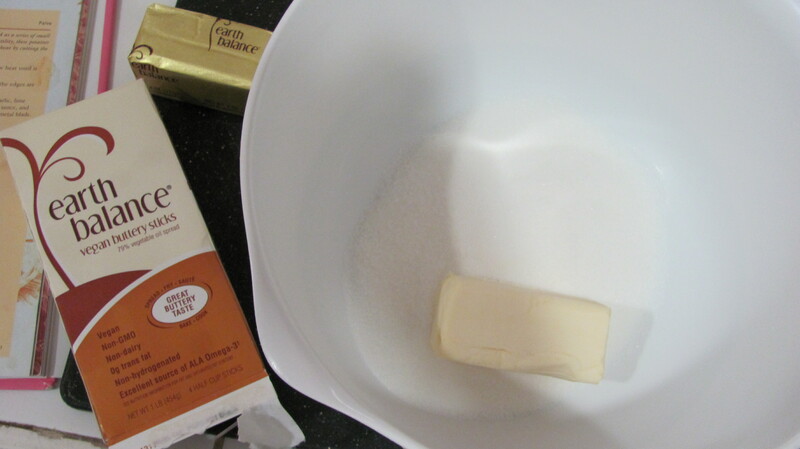 Melt butter (margarine) in a large skillet over medium low heat. Add egg and leave flat for 1 to 2 minutes (I usually cook for 3 minutes). Remove from skillet and cut into shreds. To make this part easier, I slide the egg out of the skillet (and it will slide easily thanks to the margarine) onto a cutting board. I let it cool for a few minutes and then slice it into strips using a large knife. Heat oil (I use the same amount of Sesame Oil and sometimes add a bit more based on taste preferences) in same skillet; add onion and saute until soft (since I’m skipping the onion, I go straight to the next step). Then add rice, soy sauce, pepper and chicken (and red peppers, a handful of baby spinach, etc.). Stir fry together for about 5 minutes, then stir in egg. Serve hot. 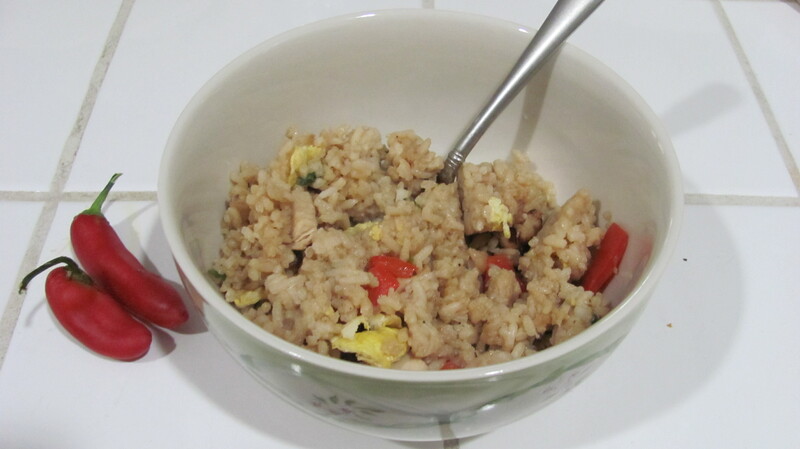 I remember reading somewhere that you should really use day-old rice to make Fried Rice, but I’ve done it both ways. I usually don’t have any day-old rice when I get ready to make this dish so I make a fresh batch and it works just fine. It’s a bit stickier than day-old rice would be but it is still very yummy. Crazy Delicious Peanut Butter Pie – And It’s Parve! Posted on October 5, 2012 by Michele D.
We were invited to a relative’s house for Shabbat lunch the week before Sukkot, and they served this crazy good peanut butter pie for dessert. It was frozen and creamy and I truly didn’t believe it wasn’t dairy. So I bodly had my Mother-in-law ask for the recipe and they were not telling a lie … no dairy in sight, but the recipe they sent me via email did call for a few eggs … in a pie that isn’t baked or cooked in any way … so I decided to visit my friend Google to try to find a similar version of said pie that doesn’t come with the chance of giving me salmonella poisoning. Beat together the tofutti cream cheese, peanut butter, sugar and vanilla. 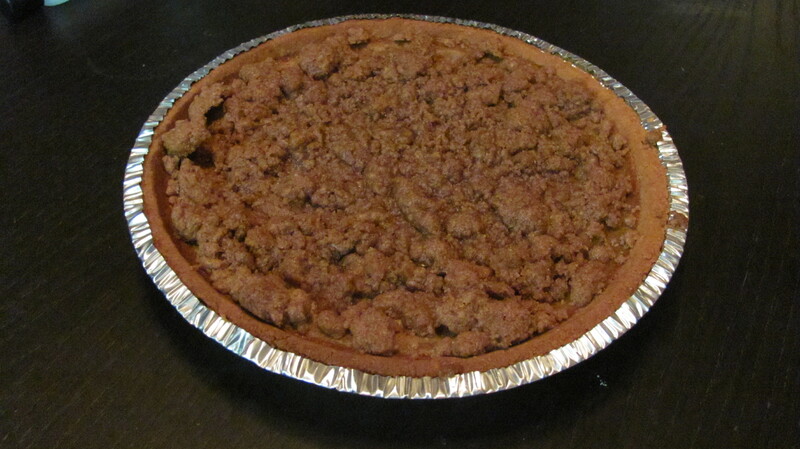 Fold in 1-1/2 cups of the whipped topping and spoon into crust. Freeze until firm (about 4 hours). Top with remaining whip and grated chocolate if desired. Return to freezer. Remove from freezer about ½ hour before serving. Easy breezy and totally delicious. 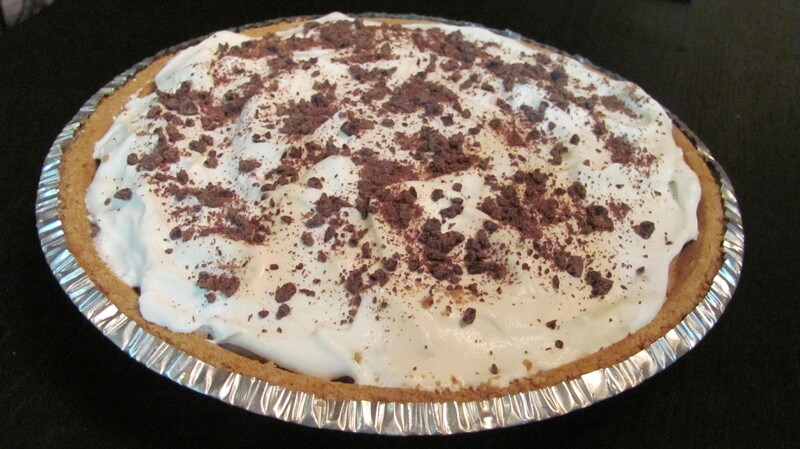 For the first pie, I did use the parve whipped cream on the top and the chopped chocolate chips. It was awesome but for the second one, I was a bit lazy and left off the whipped cream and chocolate topping. The pie was still yummy and not a bite was left so I think either way is a great option. Now, back to my raw egg discussion. Have any of you ever heard of using raw eggs in a pie that isn’t going to be cooked?